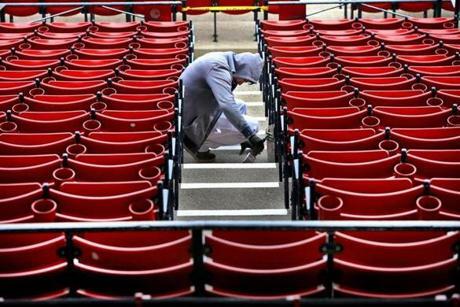 Fenway Park undergoing last-minute preparations for the Boston Red Sox opening game on Tuesday, April 9. Under the multi-year agreement, which replaces the team’s five-year deal with Foxwoods Resort Casino in Connecticut, MGM Resorts will also advertise on Red Sox-controlled radio and television stations. In August, MGM opened a $960 million resort casino in Springfield. 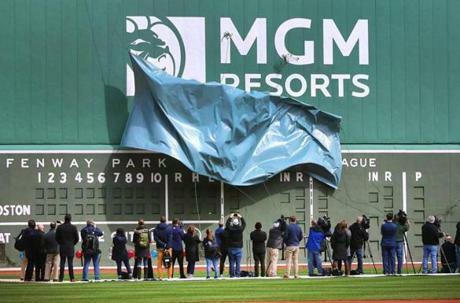 A new MGM Resorts logo was unveiled on the Green Monster. 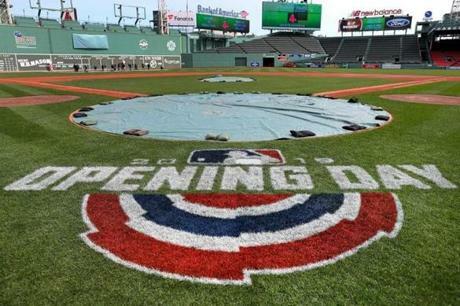 The Red Sox open at Fenway Park next Tuesday. The team also unveiled an array of new concession snacks, renovations to the press box and player clubhouses, and augmented-reality capabilities for the MLB Ballpark app, which will allow fans to roam the stadium with their phones, scan certain objects, and see them come to life. Three dozen sites support the feature, including the statue of “The Teammates” (Red Sox greats Ted Williams, Bobby Doerr, Dom DiMaggio and Johnny Pesky), the Big Concourse plaque, and various Hall of Fame plaques. When a fan scans a player’s plaque, for example, the player’s face appears on the screen and a recording plays. 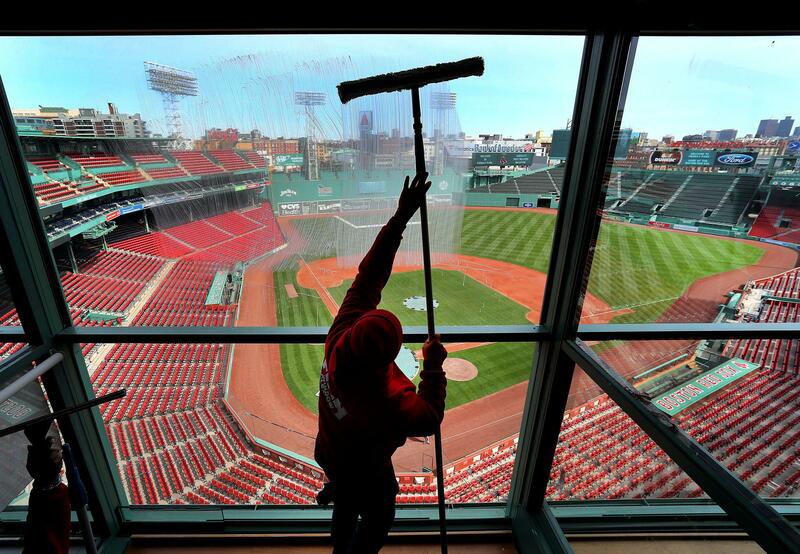 Last-minute preparations for the Boston Red Sox opening game. A pilot version of the function was released last season, but this will be the first season with a significant number of scannable items. Last season, on a peak night, about 4,000 to 5,000 fans took advantage of the feature, said Tim Heintzelman, the team’s director of creative services and content. On the food front, new concessions include banana splits, bacon on a stick, tater tots topped with buffalo chicken, pulled pork sandwiches, and lobster BLTs. Ron Abell, Aramark’s senior executive chef at Fenway, described the options to the press before presenting Murren with a tough choice: hot dog or lobster roll? He chose the lobster roll, chowing down as cameras gathered round to capture the iconic moment. A painter put white paint on the aisle steps.